Septic systems can be quite complex, and the average person doesn’t have a strong understanding of all the parts and components that work. This is understandable — it is, after all, why professional septic system service companies such as Willey Co. exist. But, being experts in these things, it’s important to help our clients to understand their septic system’s needs. One of the most important components of your septic system is the distribution box, or D-box. The D-box, in a nutshell, sort of acts as a central hub for the effluent in your septic tank. It receives the effluent from the tank, and redistributes it into a network of connected trenches and pipes. Since this is one of the central components that facilitates the movement of effluent out of your system, it’s important that it’s always accessible. A distribution box is the heart of a gravity-fed drainfield. We can open the lid and tell instantly how well the septic drainfield is working. We can also see if there are any roots or other odd features that could harm the system. 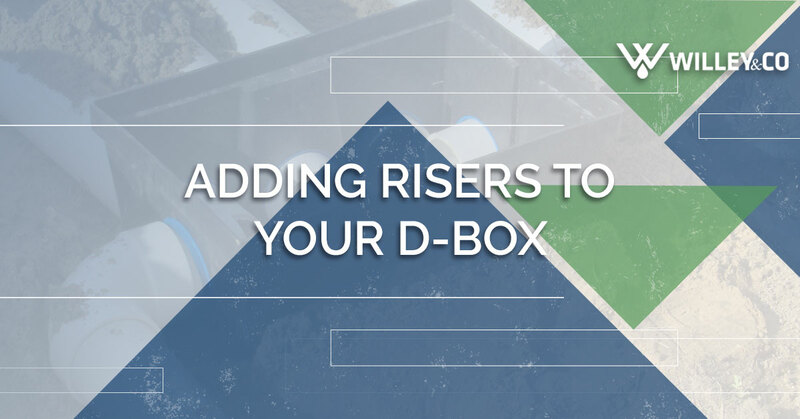 Being able to access this at any time is paramount for septic system maintenance, and that’s why Delaware has recently passed a law that requires your D-box to have risers that extend it to the final grade. Since Delaware started requiring D-boxes to have risers that extend to the final grade, we can easily access the newer ones. This is a boon for you and us both — it allows us to perform maintenance and installation better, and it allows you to get a good peek into your system without tremendous hassle. If you have an older D-box that doesn’t extend to the surface, we can provide an upgrade that will allow your D-box to have risers. During the routine septic inspections we perform for our service contract clients, this is one of the main things we do. Like anything else, if a problem is caught early, there are higher chances of solving the issue without major expense. We are seasoned experts in septic tank repair and installation, and we’ve been serving clients in the state of Delaware for decades, particularly in Sussex County and Kent County. Renovating your D-box is only one of the many services that we offer. We can perform any other repairs that are needed, install a new septic system entirely, and we also offer other services such as irrigation installation and well-drilling. Whether you need to make your D-box current, or you have need of our other services, we’re happy to help. Contact us today!